Chrichton's World: Review Opera a.k.a. Terror at the Opera (1987): Argento on the top of his game! Review Opera a.k.a. 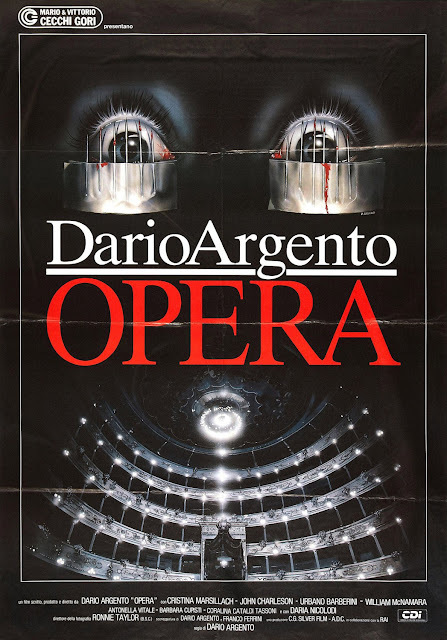 Terror at the Opera (1987): Argento on the top of his game! The first time I watched Opera it had a significant impact on me. But for some reason I couldn't recall much of the film apart from some iconic scenes. Upon watching it a second time I realized why I might have blocked it from my memory. Because Opera is terrifying brilliant and completely hilarious at the same time. Opera is suspenseful and contains enough dark elements to give you chills. The problem however is the fact how the characters are portrayed and behave. In one scene particular comedy ensues where supposed mature and intelligent characters forsake all logic and common sense and go full retard. Especially the main character acts in ways that will defy your tolerance. Yet I still found myself rooting for her and the other characters because they obviously don't deserve to be killed. The killer in Opera is incredibly ruthless and confident. Even after having slain someone the killer acts like he or she has no care whatsoever. This makes this person quite scary since how crazy do you have to be to stick around after murdering someone and not be afraid of getting caught. Although it could also be confidence since the killer does have some tricks up his or her sleeve. In any case the killer is fearless and is drawn to main character Betty (Cristina Marsillach) and wants her to watch how he or she slays his or her victims. He or she does it by tying her up and putting needles on her eyes that are supposed to stop her from blinking or closing her eyes. Just to give you an idea how merciless and cruel the killer is. If you still have doubts about that then I am sure the brutal killings undoubtedly will convince you. Like in most giallo's you are left in the dark about the identity of the killer. It could be anyone although there are quite a few red herrings to misdirect you often. Not sure if all of them hold up logic wise still it's what makes this film and the genre a lot of fun so I am sure you will have no trouble accepting the flaws. Dario Argento is at his best here since he has put in some of his own experiences directing a failed production of Giuseppe Verdi's Macbeth. Apparently that didn't went so well and if I have to believe him he was mocked for it since he tried to be creative and different. I think some critics have said the same about his successful films. And I couldn't disagree more with that notion. 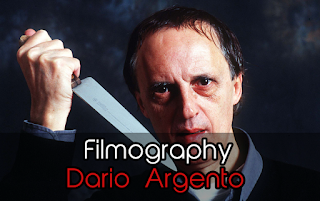 Say whatever you want about Argento he is one of the most essential directors who brought a freshness and creativity to thrillers and horror films long before it was popular. 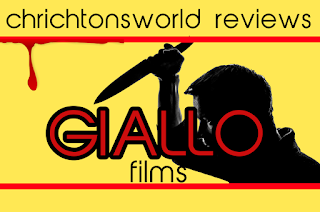 And I am eternally grateful since giallo films have brought me great joy and continue to do so while a lot of contemporary thrillers and horrors have mostly let me down. Do I really need to spell out that this is a must watch for thriller lovers? Go watch it already if you haven't already done by now!